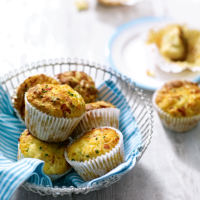 These savoury muffins are great for picnics, casual garden parties or lunchboxes. You could even bake a variety with different fillings, such as grated courgette, sweet potato, olives or crispy bacon. 1. Preheat the oven to 200ºC, gas mark 6. Line a 12-hole muffin tin with paper cases. 2. In a large bowl, mix together the flour, baking powder, bicarbonate of soda, mustard powder, Cheddar, ham and chives. 3. In a large jug, whisk together the milk, yogurt and egg. Stir into the flour mixture until lightly mixed. 4. Divide between the muffin cases and bake for 20–25 minutes until set and golden brown. Leave to cool a little before eating.